I spy the Eiffel Tower! Love the fabric used for the back. In January? Well, I just finished this counted cross-stitch pillow & there's no time like the present to post it on my blog. The other Halloween pillow was for Stella; this one's for Freddie. 148 fussy-cut hexagons! Was fun to hunt for all the different fabrics. 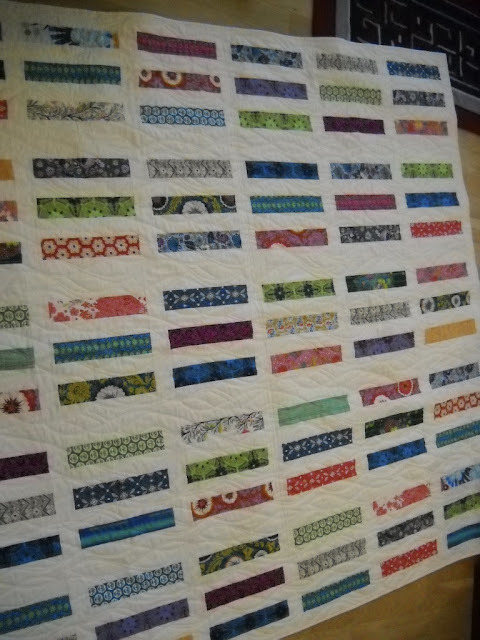 Simple yet time-consuming straight-line machine quilting. Counted cross stitch pillow -- just in time for Halloween! Leftover fabric makes for a simple quilt! Measures ~36" x 40" -- will be a nice gift for a new baby. Crocheted -- so colorful & small -- ~24" x 28" -- perfect for a car seat or stroller. A paper-pieced quilt for our friend Bruce. It was too big for me to machine quilt it myself -- it's ~56" x 62" -- I sent it to Quilt Hollow for her expert long-arm machine quilting. 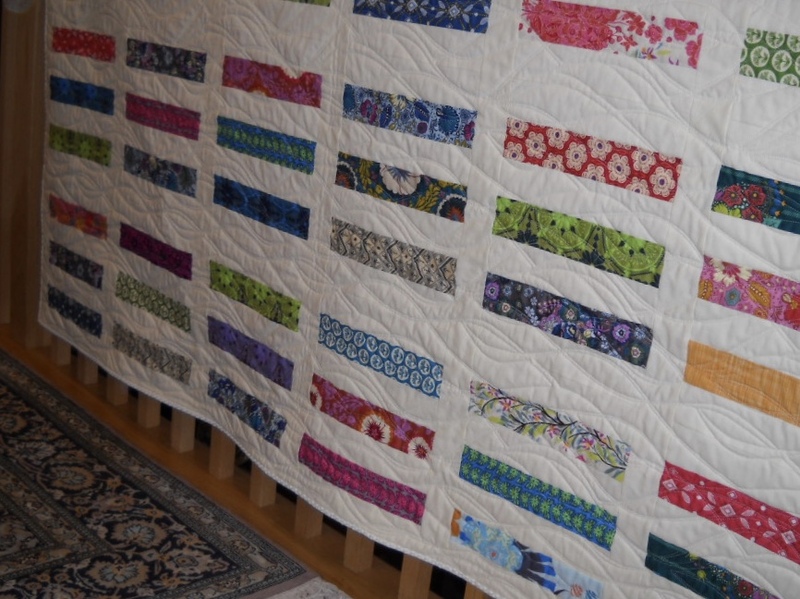 The theme of the quilt is anchors, stars -- for an ex-Navy guy. The quilting has stars & anchors, too. Hard to see in the pix. The colors are navy, gray, light gold, off white, black. The fabric used for Stella's 1st Birthday Quilt is called "Stella" -- how appropriate is that?! A simple pattern, simply quilted by machine. I loved this yarn -- 100% merino wool from Wales -- lovely to crochet but I had an odd number of skeins so it turned out to be an odd size -- 37"x44" -- will keep it as a throw for chilly nights. Not sure why the edging is ripply but I kind of like it that way. Adds even more interest to the blankie.